You’ve had clients like these: The ones who hid nanny cameras on the jobsite to surveil your crews, or walked around your project during framing with a level and left orange sticky notes on the studs they wanted you to do over. But there are worse customers. Clients who believe a new house means a perfect house. If anything goes wrong, they’re always right. Take on these customers from hell and your company could be sued out of existence, which, as one builder interviewed for this story explains, is happening to a long-time builder acquaintance of his in the Northeast because that builder didn’t heed the warning signs before taking on a client who could never be satisfied. To get an accurate read on people, custom builders often need to play psychologist. Vetting prospects and choosing your customers can be part art and part skill, honed through years of wisdom learned from past mistakes. But intuition also plays a role. Avoiding the nightmare client can be as basic as trusting your gut instinct. Some builders say they can tell within an hour of meeting a prospect whether they will take them on or cut them loose. For instance, Brian Bailey, of Bailey Homes, in Austin, Texas, says he will never accept a client that he wouldn’t want to invite into his own home. “If I’m around somebody that I wouldn’t enjoy having come over to my house to have dinner, then I wouldn’t consider them as a client,” he says. Dallas builder John Sebastian notes that when prospects interview him to determine whether they should hire Sebastian Construction Group, he’s also auditioning them. As Sebastian and his team meet prospects at their home, place of work, or at a restaurant, they’re watching how that person treats other people. Does he or she respect the receptionist, the help, waitstaff, coworkers? “How they treat their receptionist is probably how they treat everybody,” Sebastian says. Considering that a custom home project can run two years or longer, Tim Hensley, president of Hensley Custom Building Group, in Loveland, Ohio, sizes up prospects by asking himself if he would go into business with these people. “That’s what you are doing when you’re building somebody a home,” Hensley says. “We only do 10 to 14 homes a year, so it’s a personal relationship between me, my team, and my clients. So one of the first things we look for is how will we get along as a partnership in building your home.” Also, he gravitates toward prospects who are similar to the good clients the firm previously built homes for, as Hensley uses them for referrals. 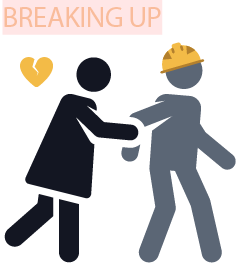 later during preconstruction planning, how should a builder ask for a divorce? Blame yourself and then walk away. Dropping a client or a prospect is like breaking up. The experience can be emotional. One builder half-seriously said that, if callously handled, the party being dumped may seek revenge by suing for lost time. Another out is telling the prospect that you have a full workload that prevents you from building their house. When the two sides met again, Hensley learned that the builder for his client’s previous home in Connecticut went out of business, leaving him without warranty protection. Hensley won him over to the original contract by offering to hold back $10,000 of the final payment to cover punch list items. In the past three years, Sebastian has backed away from six large deals that were in various stages of preconstruction. The red flags usually were an accumulation of dysfunction that prevented the projects from progressing, such as clients changing their design numerous times or firing multiple architects. In some cases, Sebastian dropped customers after working with them for eight months and incurring up to $200,000 in preconstruction expenses. So what’s so demanding about these professionals? Brian Bailey, of Bailey Homes, in Austin, Texas, has built for several engineers who founded publicly traded tech companies. His approach with these clients: Understand what their expectations are and model the project around them. For example, if the project is a cost-plus job, help them to understand how much more money it will cost to take their house to the next level, and let them decide whether to pay more money to get there. “I’m not scared of them, but at the same time, I want to know what their expectations are, and if I can’t meet those expectations in any scenario, then I’m not going to do [the project],” Bailey says. Indeed, many builders noted that when a client pushes for structural changes in the contract after going through the planning process and sitting through explanations about how the construction process is managed, that’s a red flag. Arpan Gupta, founder and president of Carnegie Homes & Construction, in Houston, walked away from a customer who came back at him with a lawyer who tried to “slice and dice” his contract. The buyer wanted to alter the time line for handling change orders from days to weeks, among many other “tweaks.” Gupta doesn’t mind negotiating and giving in on small issues to achieve the greater goal, but this client was battling for a multitude of minutia, so the builder decided to drop the deal. He has found, from experience, that giving in to variances from Carnegie’s process opens his staff up to errors and inefficiency because they’re spending more time trying to remember and accommodate the nuances in the one client’s contract that was different from the others. As part of a strategic planning exercise, Sebastian’s team created a report card identifying the traits of ideal clients for the company in terms of demographics and psychographics, simply rating potential clients on each attribute with a plus or minus. Ranking prospects helps Sebastian Construction Group eliminate any starry-eyed hopes—particularly when the builder is looking at a lucrative multimillion dollar deal—and think carefully about who to jump in with. Hensley would welcome an independent inspector as long as that person is not a forensic home inspector. These inspectors tend to be anti-builder and usually are hired by owners of finished homes to look for lawsuit ammunition. He’ll also drop prospects who want to subcontract some of the work themselves. Doctors can be challenging clients because they work in settings where they give orders to nurses and medical technicians. No one tells them what to do. Yet doctors are at the top of Hensley’s list of favorite clients because they understand that, although they’re good at what they do, the builder is the expert in home construction. Despite Hensley’s experience, custom builders told us that, as a group, attorneys tend to be OK, too. Abrams has found that his lawyer clients appreciate a simple contract that means what it’s supposed to mean. In fact, some of his attorney clients have helped him refine his own contracts. It’s non-lawyers who think they are lawyers and nitpick that are dangerous, Abrams says. “One thing we find is that people who are really accomplished and good at what they do really make good clients because they don’t pretend that they can do our job,” he says. Unfortunately, builders can’t always recognize the clients from hell during the initial meet and greet. Red flags may not pop up until the builder and client are deep in preplanning. Even if the outlay in time and money spent on preconstruction planning is significant, don’t be tempted to stick it out and hope there will be a return on investment down the road. Bailey once dropped a $20-million project after spending $10,000 on attorney fees when the client starting nitpicking in the late stages of contract negotiations. Comments on: "How Builders Can Avoid Difficult Clients"